Ellen Seibert is a freelance viol player in Seattle with performances with the Accademia d’Amore workshops, St James Cathedral, the Medieval Women’s Choir, St Mark’s Choir, Our Lady of Fatima and Blessed Sacrament Churches. She is a member of the Trinity Parish Consort and the New Baroque Orchestra. She has taught many new viol players and regularly teaches beginning viol at the Port Townsend Early Music Workshop. For seven years she co-taught beginning viol to cello and violin students at Roosevelt High School in Seattle. She has been a board member of the Seattle Recorder Society, leading viol ensembles at meetings in past years. A founding board member and former president of Pacific Northwest Viols, Ellen has also served on the board of the Early Music Guild of Seattle and the Viola da Gamba Society of America. She guarantees that beginners will enjoy the wonders of holding a beautiful instrument and drawing a bow across its strings and will play harmonious tunes by the end of the week. For Those Who want to Try out a Viol! 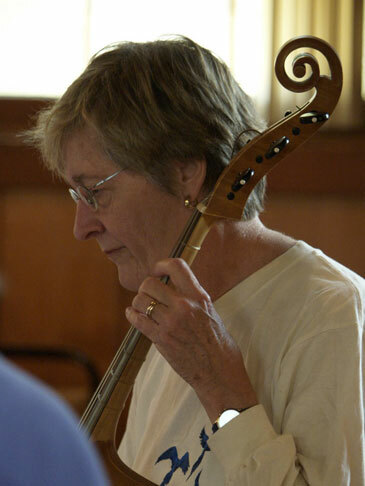 Ellen has been at PTEMW since its inception in 1983 and teaching a beginning viol class since 1997. It would simply not be the same without her!